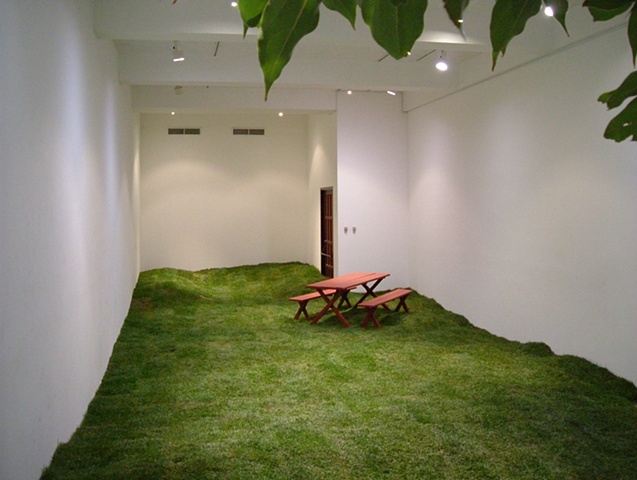 I installed a full-scale recreational park within a 1000 square foot gallery. Twenty-three cubic yards of landscaped earth, rolls of sod, a tree, and a picnic table intervened in the middle of downtown LA. Visitors played games, read under the tree, picnicked, and threw parties in the park. A successive work, "Earth for a Dollar" reconstituted that exhibition’s materials, repackaging and distributing remnants through a commercial transaction of earth plots.